Set in the unspoiled splendour of the Costa Smeralda, a hotel that embodies an ancient charm, the purity of lost Mediterranean. The Cervo reflects the spirit of Costa Smeralda. The sunny and exclusive lands. A grand, almost surreal trompe l'oeil. Hotel Calal di Volpe. A distinctive and privileged setting. A whitewashed structure that winds around a fragrant garden. Rosemary, flowers, juniper. The harmony of secret refuge. 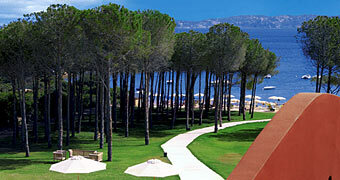 The Hotel La Coluccia is the perfect place in which to absorb the magical atmosphere of Sardinia.